Golden Helicons forage on nectar and pollen in the rainforests of South America. This week Bug of the Week takes a respite from our series on home-invaders (Home invaders I (LINK OCT 13, 2008) and Home invaders II (LINK TO OCT 20, 2008)) to visit some fantastic insects dressed in orange and black (Bugs in orange and black (LINK OCT 31, 2005), Bugs in orange and black II (LINK TO OCT 30, 2006) and Bugs in orange and black III (OCT 27, 2008)) just in time for Halloween. Our first stop takes us to the rainforests on Central and South America to meet the gorgeous Golden Helicon butterfly. The Golden Helicon belongs to a clan of tropical butterflies called Heliconius butterflies that are notable for their longevity. These beauties live up to six months and evolved an interesting strategy to gather nutritious pollen used to sustain their long lives. Each day Heliconius butterflies traverse a defined route through the forest visiting flowers that present a fresh batch of pollen. This behavior is called trap-lining and is employed by many tropical pollinators including bees, hummingbirds, and bats. After collecting a gob of pollen on its long, straw-like proboscis, the butterfly secretes specialized enzymes to release amino acids and other nutrients in the pollen. The nutrients are absorbed through the membranes lining the proboscis and used by the butterfly to produce eggs and maintain its high level of activity zooming about the forest. In addition to visiting flowers laden with pollen, the Golden Helicon also searches for different species of plants in the passion vine genus, Passiflora. These tropical vines bear the magnificent passionflower. Several species of passion vine are used by the immature stages of the Golden Helicon and other Heliconius butterflies as a source of food. This Queen butterfly is a champion at scaring predators away. Our next stop is southern Florida to visit the Queen. No, not Elizabeth the Second or the rock band, but the Queen butterfly. The Queen is a close cousin to the Monarch butterfly (JAN 28, 2013) we met in previous episodes of Bug of the Week. Unlike the Monarch that enjoys long distance travel, Queens like to stay at home in their native range from Brazil northward to the gulf and southwestern states on the US. The female Queen lays eggs primarily on plants that are members of the milkweed family. The gorgeous Queen caterpillar eats milkweeds and other toxic plants. After several days, the egg hatches and a tiny caterpillar emerges and consumes nutritious leaves. 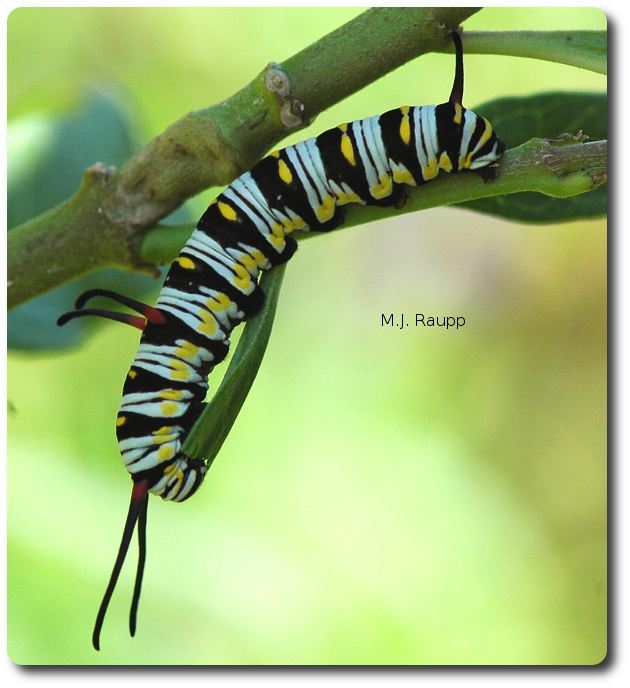 From the milky sap of the milkweed the larva obtains potent defensive chemicals known as cardiac glycosides. These compounds are stored by the caterpillar and passed along to the adult butterfly. Birds are important predators of many butterflies including Queens and their young. Cardiac glycosides sequestered from the milkweed and stored in milkweed butterflies can cause predators such as blue jays to vomit after taking a bite of a butterfly wing. How’s that for trick or treat? Oh wooly bear, please tell me this winter will be mild. Our last guest is common now along roadways, sidewalks, and bicycle paths as they make their way from their summer feeding grounds in the meadow to protected places beneath logs or stones to spend the winter. The woolly bear caterpillar begins its life as vegan in the spring when it hatches from an egg laid by its mother, the Isabella tiger moth, on a plant such as a dandelion or aster. To complete its development the larva munches plant leaves during the spring, summer, and early autumn. It moves from its food to find a protected location to survive the rigors of winter. The woolly bear overwinters as a caterpillar, but when the warmer temperatures of spring arrive, it spins a cocoon and completes the transformation to adult moth. The moth is pretty tiger moth, but the caterpillar certainly catches one’s attention with its alternating bands of black and orange. The banded woolly bear has two black bands, one at either end, and an orange band in the middle. 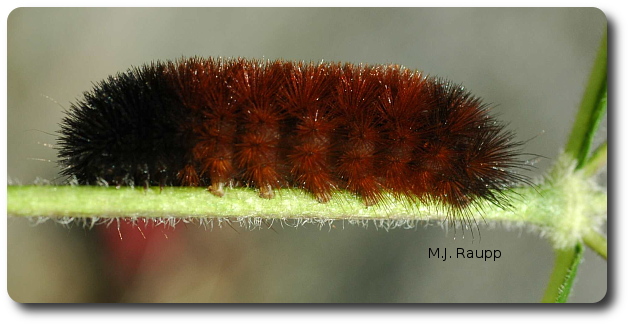 A popular folktale has it that the woolly bear is the harbinger of the harshness of the winter to come. A wide orange or brown band in the middle indicates that a mild winter is at hand, conversely, a narrow band of brown or orange means that a long, severe winter is on the way. A noted entomologist from the American Museum in New York City, Dr. Curran, tested this idea by collecting woolly bear caterpillars from nearby Bear Mountain Park each year between 1948 and 1956. He used his observations to forecast the severity of the upcoming winter and his accounts were published in The New York Herald Tribune. Several other entomological experts around the country have used various clues garnered from the woolly bear to prognosticate winter weather. Claims of 70-80% accuracy are not uncommon. As for me, well, the little woolly bear captured in my photograph sure looks like it is wearing a lot of orange. With the price of fuel oil, I’m hoping this hairy rascal is telling me “no worries, a mild winter is on the way”. To learn more about Golden Helicons, Queens, and Woolly Bears, please visit the following web sites. Bug of the Week wishes you a Happy Halloween!